Dissolve sugar and yeast in warm milk in a large bowl. Let stand 5 minutes. Stir bread and rye flours, salt and caraway seeds into wet ingredients until a soft dough forms. Dump contents on the counter and knead until smooth dough begins to form, about 5-10 minutes. If needed, add 1 tbsp of flour to dough at a time to prevent dough from sticking to hands. Cover dough and let rest 10 minutes. Roll out dough into a 12 x 10-inch rectangle on a lightly floured baking sheet. Spread softened butter over dough. Working with long side, fold up bottom third of dough. Do the same with the other length of dough, forming a 12 x 3-inch rectangle. Cover with plastic wrap and put in freezer for 10 minutes. Remove dough from freezer. Roll out dough and repeat step 4 (still on a baking sheet). Cover with plastic wrap and put in freezer for 10 minutes. Remove dough from freezer. Roll dough (still on a baking sheet) into a 8 x 12-inch rectangle, short side towards you (make into a 12 x 12-inch square for smaller rolls). Working with short side, roll dough like you would a jelly roll; wet your fingers to pinch the seam closed. Cut roll into 8-12 equal slices and place on baking sheet. Lightly spray tops of rolls with cooking spray. Cover and let rise in a warm place for 45 minutes to one hour until doubled in size. Brush egg wash on tops of risen rolls. Sprinkle caraway seeds on tops of rolls. Bake dough for 10-15 minutes until golden brown. Remove from pan and let cool on a wire rack for 5 minutes. I'm sitting here, looking out the window of my apartment and watching a rainy mist fall through the cool air on what seems to be yet another dismal spring evening. It's been raining on and off for the past four days now. Some days we've been lucky enough to feel a patch of dry grass and see the sun poke through the clouds, but mostly, it's just been cold, cloudy and misty. Days (or weeks, as it may turn out to be) like these have me unreservedly yearning for faraway places - Australia, perhaps? Greece? Italy? I'd even go somewhere off the list of "Dreamy Vacation Spots," like Japan or Russia. Anywhere but here is where I want to be. Being that I traveled many a land in my young life already (Amsterdam and India and Germany and France, how I miss you!) I can't be too greedy in my desire to set foot on the other side of the earth, but maybe all that traveling is what's given me such restless legs. All this to say that, in these moments of wanderlust (the quantity of which far outweighs my travel funds), I've had to find ways to feel as though I've somewhat traveled off the beaten path, even if I haven't stepped outside my kitchen. Enter Caraway Swirl Rye Rolls. I know what you're thinking. 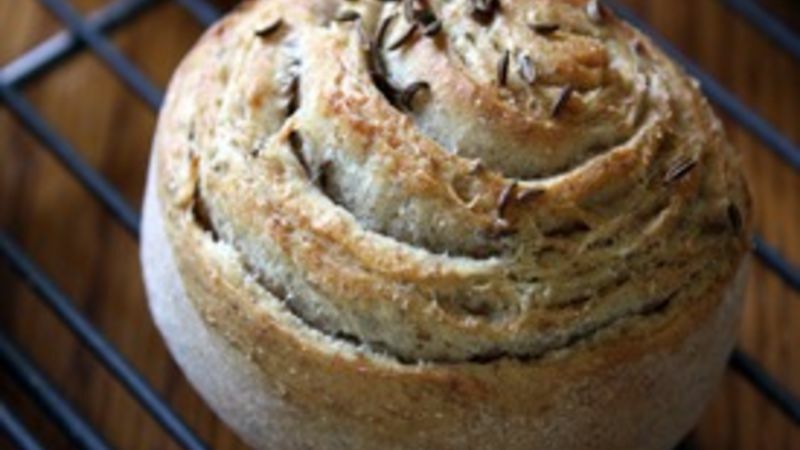 Caraway Swirl Rye Rolls - how in the world do these rolls make you feel like you've traveled to exotic lands? It's true, these rolls aren't based in olive oil, nor are they chock full of Asian spices, nor do they seem nearly the sort to be huddled together in a cloth basket on the front of a Parisian's bicycle next to a fresh baguette. But these rolls do instill in me a sense of being a castaway on a desert island. Maybe it's the play on words (caraway, castaway, awfully close), or maybe it's the whimsical pinwheel shape they take on while browning in the oven, but regardless, Caraway Swirl Rye Rolls are just enough to satisfy my travel bug. These rolls are incredibly simple to make, thanks to their need to only rise once (such unselfish little rolls, they are). But they are finicky in the oven and can burn easily, so make sure you check on them after about 10-12 minutes of baking. They are incredibly versatile, and though I like to make mine big enough to suffice as a medium-sized hamburger bun, you can roll out the final length of the dough to make up to 12 swirly miniature rolls. And the tiny, half-mooned shaped caraway seeds resting on the spherical staircase on top of these mildly buttery rolls make me wish that was me, basking in the sun on the steps of the Roman Colosseum. It's a stretch, I know, but it's a comfort while I look out my window, wishing it would just stop raining.